Dr. Jondelle B. Jenkins received her undergraduate education at Northwestern University. She then went on to complete medical school at Dr. William M. Scholl College of Podiatric Medicine at Rosalind Franklin University, graduating in 1983. Dr. Jenkins has been in practice for over 30 years. She is board certified by the American Board of Podiatric Surgery and a partner of the American Podiatric Medical Association. Dr. Jenkins holds hospital affiliations with Advocate Trinity Hospital, Advocate Condell Medical Center, Advocate Illinois Masonic Medical Center, and Mercy Hospital & Medical Center. Dr. Whitney K. Castle attended medical school at Dr. William M. Scholl College of Podiatric Medicine at Rosalind Franklin University, graduating in 2012. She then went on to complete residencies in Podiatric Surgery at Dr. William M. Scholl College of Podiatric Medicine and John H. Stroger Jr. Hospital of Cook County. Dr. Castle has been in practice since 2013. She holds hospital affiliations with Advocate Trinity Hospital, Little Company of Mary Hospital, Advocate Condell Medical Center, and Advocate South Suburban Hospital. Dr. Sonia Goyal attended medical school at Dr. William M. Scholl College of Podiatric Medicine at Rosalind Franklin University, graduating in 2009. She then went on to complete a residency in Podiatric Surgery at Weiss Memorial Hospital. Dr. Goyal has been in practice since 2010. She holds hospital affiliations with Advocate Christ Medical Center, Advocate Trinity Hospital, and Weiss Memorial Hospital. Dr. Goyal has clinical interests in foot and ankle care, diabetic wounds, and sports injuries. 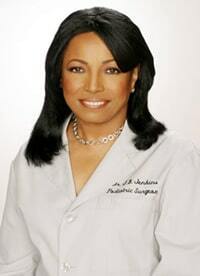 Dr. Sabrina Landers attended medical school at Dr. William M. Scholl College of Podiatric Medicine at Rosalind Franklin University, graduating in 2013. She then went on to complete her residency at Advocate Illinois Masonic. Dr. Landers has been in practice since 2013. She is a member of the Illinois Podiatric Medical Association and the American Podiatric Medical Association.